Integrating digital marketing strategies into trade show promotions before, during and after each event will help boost your trade show results. Through a combination of website, e-mail, mobile and social media strategies, you will increase exposure and message frequency to your target audience. This will add momentum to your event marketing efforts and, in turn, enhance your return on investment. Develop a special section on your website to promote your participation in the upcoming event. Be sure your new trade show pages are written and built to leverage to help your business presence on Google, Yahoo, Bing, and Ask search engines. Promote the web section on your site in all printed materials and advertisements, as well as through email communication and regular Twitter and Facebook postings with clients and prospects. In addition, research and implement web advertising techniques including special banners, links and promotional copy that attract visitors to your site and trade show information. Identify marketing vehicles used by other the exhibit sponsors and see if you can use the same publications, websites and newsletters for your marketing initiatives. Ask select current customers about their recommendations for your marketing. You may be surprised by the insights your clients are willing to share to help you succeed. Create excitement through a pre-show contest, quiz, drawing, game or other incentive on your website. Include an enticement to come visit your booth during the event for the contest winners, quiz answers, etc. 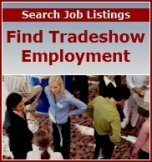 As part of your web-based trade show promotions, create a form for interested visitors to complete if they cannot attend the show, yet want follow-up information (or contest results). Or if they are planning to attend the show, have visitors complete a form to schedule a product demonstration or meeting with you at the event. Then, follow-up by phone to confirm the appointment. In addition, consider sending a series of emails to promote the show and include valuable "how-to" information so the communication provides a service to your prospects and clients. You also may use e-newsletters for this purpose if you already have them in place. Utilize Twitter, Facebook, Pinterest, and LinkedIn to create buzz for your trade show display during the event. Click here for tips on leveraging social media. As you talk with visitors at your booth who represent high-potential prospects, ask for email addresses and social media account information to add to your lead database, as appropriate. If you publish an e-zine or e-newsletter with helpful tips, people will be more willing to give you their email address and other contact data to receive valuable information that will help them be more successful. Always position your request for contact information as an effort to provide a benefit or service. Use your website to highlight winners from trade show promotions (i.e. drawings, game winners, etc.) you have at your booth. Let online visitors register for your contests, drawings, and other incentives if they are unable to come to the event. Tweet and add Facebook postings throughout the show. Have your website updated each day with event news, workshop recaps, speaker summaries and other information so conference attendees and those who could not come will get the latest news and information. This will further position you as an expert and key industry resource in your field. Consider adding photographs and streaming video of product demonstrations from your exhibit. Interviews with current customers and testimonials from your event are also powerful, credible ways to get your sales message across. Use new prospect contact information to develop an ongoing, targeted communications program that includes Twitter and Facebook posts, email communications, e-newsletters, etc. Remember that people use digital media to get helpful information. Give them what they need and want – substance in the form of ideas, tips and counsel that will help them be successful. Continually update your website with new information and helpful advice so your target audience will want to return often and refer others to your company.